One of the things I love doing with wedding couples is walking around to find cool places to take photographs. Sometimes it is revisiting places I have seen before and trying to make something new and different, and other times it is finding someplace I've never shot at before. With Gina and Ben yesterday, we were walking around the area by Seattle City Hall. City Hall is a beautiful building that has tons of great architectural details that make for cool colors and textures in photographs. One of the challenges with photography is finding light that looks good and works for the photograph that I am trying to create. For this image, I was looking from below at this glass box structure and noticed that the sun was streaming through it. We walked around to the other side to see that it did look pretty awesome. It is the top of an elevator shaft that has been extended into a glass box with different colors of stained glass circles hanging from the top in the middle of the glass box. However, there were all sorts of tables and chairs in the way, which were both bolted to the ground and bicycle chained to each other. Because of that obstacle, I chose to shoot waist up types of portraits (hard choice), and just use the elevator shaft art project as an out of focus background. The sun was also reflecting off of the windows of City Hall behind us shooting harsh, mottled light. I moved them around a bit to get the lighting on their faces even. The final challenge was the I was shooting towards the sun which created lens flare. I tried some images with the flare creating some haze and some without. When I am taking posed photographs, I usually get the couple posed how and where I want and then work the scene for a couple minutes with different lenses and shooting from different heights and changing the composition to give myself lots of options. 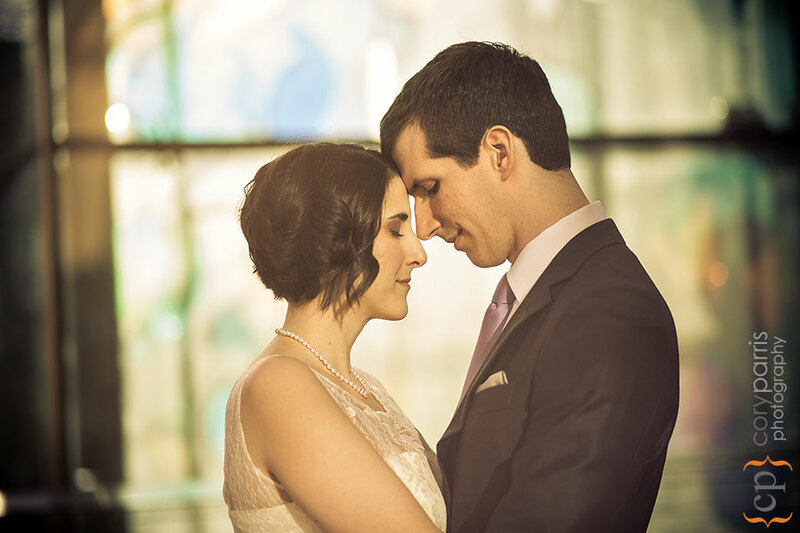 I ended up choosing an image to share that had flare, but I lessened it some in Lightroom for just a touch of hazy romance around Gina and Ben. I like that ending photograph.